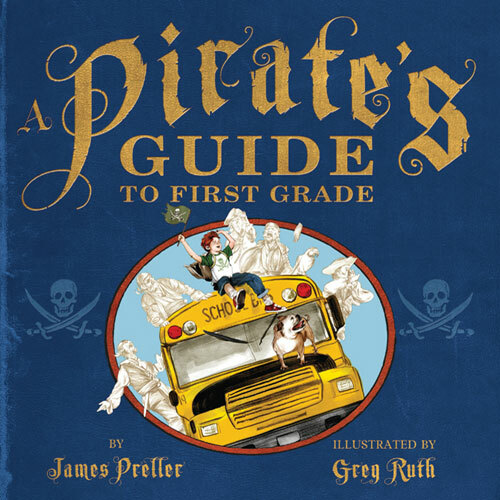 Below you’ll find various images from two books that I cooked up with the brilliant artist (and occasional “bilge rat”) Greg Ruth — A Pirate’s Guide to First Grade and A Pirate’s Guide to Recess. 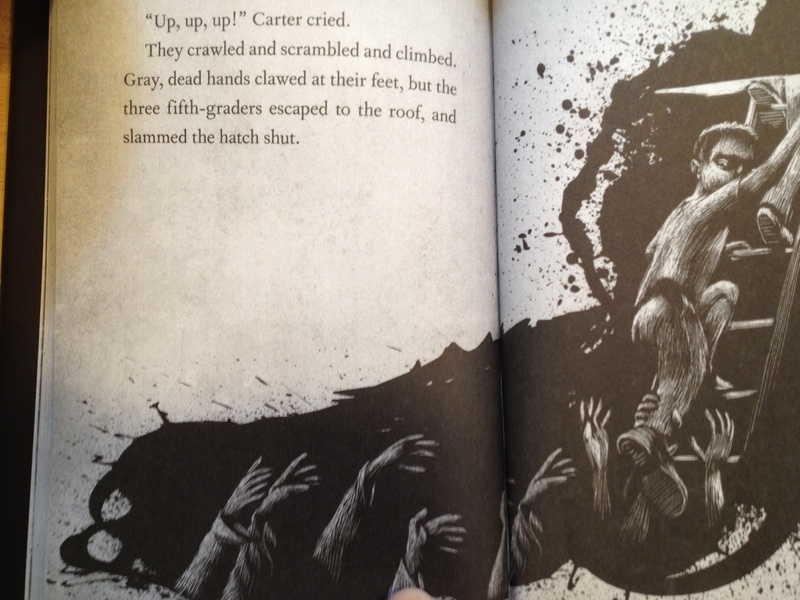 Now double quick, set your goggles here for some review snippets about the First Grade title . . . plus Greg’s great work. “Told entirely in pirate lingo, this story follows a boy and his entourage of ethereal salty dogs through the first day of school. ‘Me great scurvy dog slurped me kisser when I was tryin’ t’ get me winks!’ The protagonist’s fruitful imagination turns ordinary routine into a high-seas adventure complete with a small, skirted buccaneer walking the plank during recess. In the end, where does X mark the spot? Treasure abounds in the library, with the chance to experience the adventure of the written word. The illustrations have a vintage feel, complete with boisterous grog-drinking, scabbard-waving, and bubble-pipe-smoking pirates. The combination of the muted tones of the pirates with the bold colors of the real world adds to the visual appeal . . . it can serve as a tremendous read-aloud, especially on Talk Like a Pirate Day.”—School Library Journal, Starred Review. “Preller’s buoyant pirate-inflected storytelling and Ruth’s illustrations, which have a decidedly vintage flair, form an exuberant tribute to imagination and a spirit of adventure.”—Publishers Weekly, Starred Review. “Young would-be buccaneers facing their own first-day jitters will enjoy this droll title, which ends with a cheer for libraries. A great choice for sharing on September 19, International Talk Like a Pirate Day.” – Booklist. Fan Mail Wednesday #176: The Video! This one comes with a book trailer! I really enjoy your book. I am a student in edm 310 at the Univerity of South Alabama. My assignment this week was to make a book trailer. I chose your book because my kids enjoy it so much. I wanted to share the trailer with you. Thanks for sending along that link. I love the trailer. Love the focus on the boy’s journey, well-edited, and the music was especially invigorating. It got me standing up, marching around the room, punching myself in the chest. (Which hurt a little bit, btw.) I was, I should say, fully prepped for a reading adventure! I love Greg Ruth’s artwork in that book. He’s pretty spectacular and has a new graphic novel out, The Lost Boy. A staggering talent and a nice guy, too. There is also a sequel out, A Pirate’s Guide to Recess. 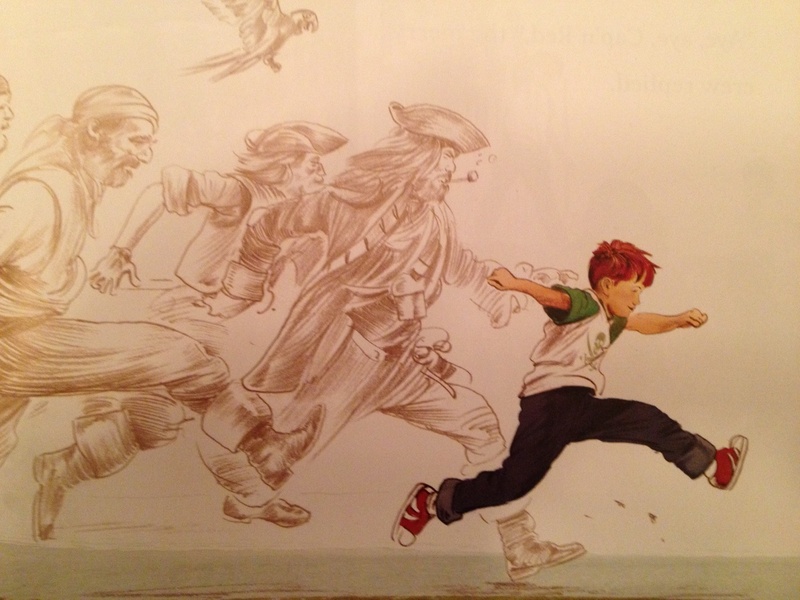 It expands on the boy — Greg and I call him “Red” — and his imaginary world, as it collides with another first-grader, Molly, and her swashbuckling crew of seafaring scallywags. Good luck in your teaching career. We need good, young, committed teachers, now more than ever. Thank you for choosing that honorable path. Wake Up, It’s Pub Day! 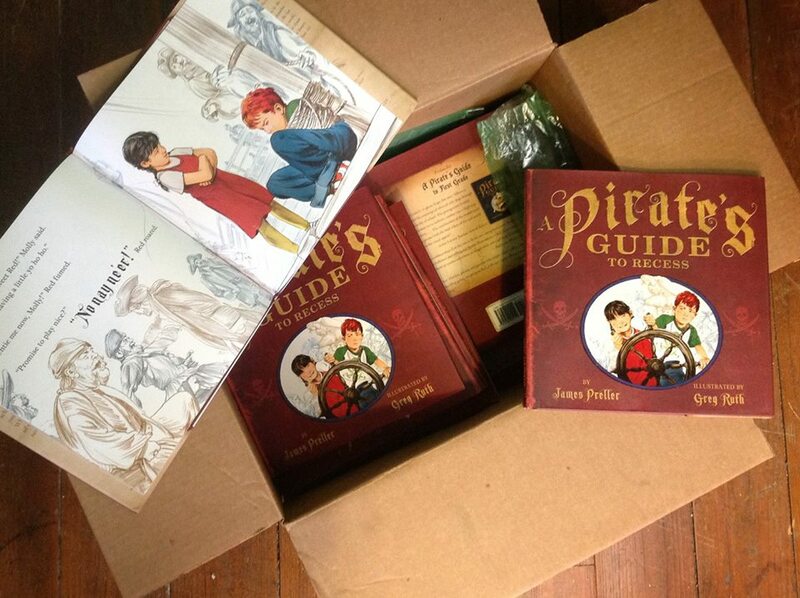 Today is the official “pub day” for A PIRATE’S GUIDE TO RECESS. You can run out and buy a dozen copies right now. There’s nothing stopping you any longer. You can buy ’em by the box! 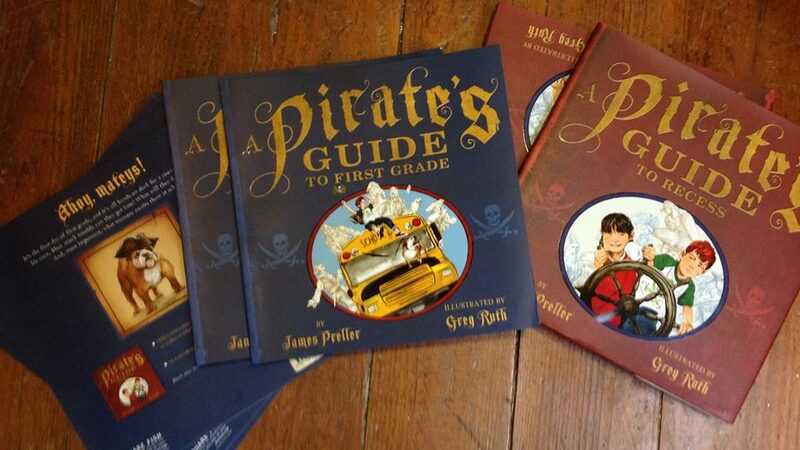 And while you’re at it, stock up on the new paperback version of A PIRATE’S GUIDE TO FIRST GRADE. It’s cheaper than the hardcover! Both are illustrated by Greg Ruth, who is awesome. Preller and Ruth transform a school playground into a swashbuckling adventure featuring two rival captains—Red (from the previous book) and fearsome Molly. Their respective pirate crews are again rendered in pencil, creating a ghostly effect, and their surly theatrics will pull readers through this nautical fantasy. “Don’t scowl so, sweet Red!” Molly tells Red after his crew mutinies. “We’re just having a little yo ho ho.” Preller and Ruth put kids at the helm as they communicate the joy of escaping into a world of pretend. 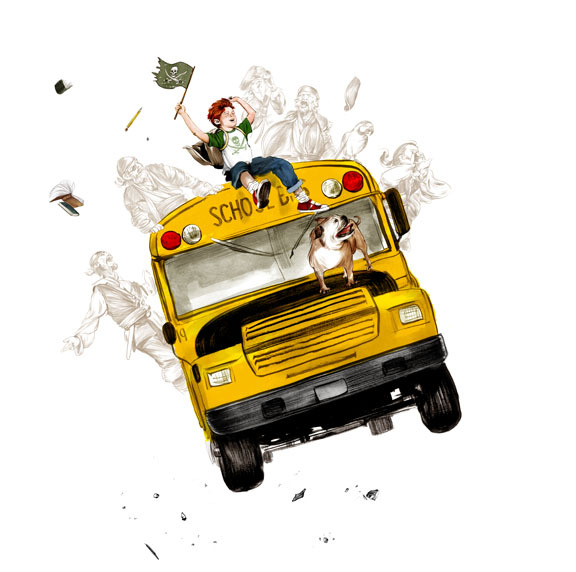 Greg Ruth created a lot of great illustrations for our upcoming book, A Pirate’s Guide to Recess, but I have to say that the one above has a special place in my heart. Not because it’s the “best,” but that it captures what for me is the essence of this book, and really a big part of childhood itself. The boy off and running, trailed by whomever or whatever he might conjure in his waking dreams. In this case, pirates. In another, dinosaurs. Or ballerinas. Or baseball players. No, you just jump into it . . . and play. Which is how Molly deals with Red out on the playground. They become real friends through their imaginative worlds.